B cells require MHC class II (MHC II)-restricted cognate help and CD40 engagement by CD4+ T follicular helper (TFH) cells to form germinal centers and long-lasting Ab responses. Invariant NKT (iNKT) cells are innate-like lymphocytes that jumpstart the adaptive immune response when activated by the CD1d-restricted lipid α-galactosylceramide (αGalCer). 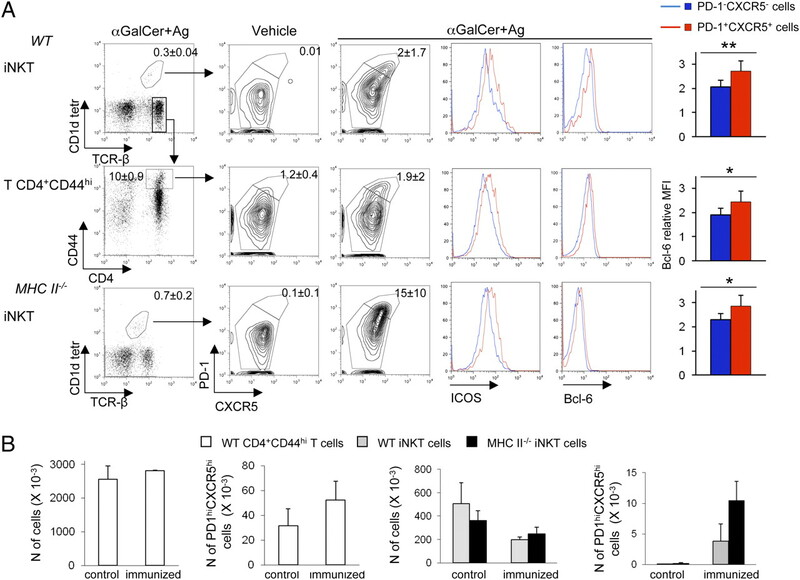 We previously observed that immunization of mice lacking CD4+ T cells (MHC II−/−) elicits specific IgG responses only when protein Ags are mixed with αGalCer. In this study, we investigated the mechanisms underpinning this observation. We find that induction of Ag-specific Ab responses in MHC II−/− mice upon immunization with protein Ags mixed with αGalCer requires CD1d expression and CD40 engagement on B cells, suggesting that iNKT cells provide CD1d-restricted cognate help for B cells. 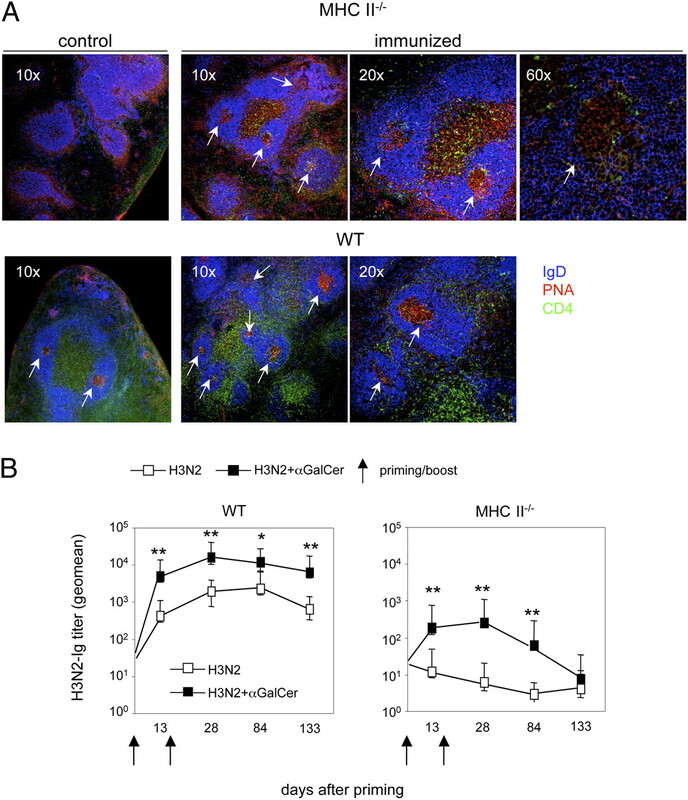 Remarkably, splenic iNKT cells from immunized MHC II−/− mice display a typical CXCR5hiprogrammed death-1hiICOShiBcl-6hi TFH phenotype and induce germinal centers. The specific IgG response induced in MHC II−/− mice has shorter duration than that developing in CD4-competent animals, suggesting that iNKTFH cells preferentially induce transient rather than long-lived Ab responses. Together, these results suggest that iNKT cells can be co-opted into the follicular helper function, yet iNKTFH and CD4+ TFH cells display distinct helper features, consistent with the notion that these two cell subsets play nonredundant functions throughout immune responses. The induction of long-lasting Ab responses that protect from infectious pathogens requires the formation of specialized structures in secondary lymphoid organs, called germinal centers (GCs), where Ig somatic mutation, affinity maturation, and class switch occur (1). GCs are usually generated as a result of Ag–cognate interactions between a particular subset of CD4+ Th cells, defined T follicular helper (TFH) cells, and B cells and depend upon the engagement between CD40L (CD154) on TFH cells and CD40 on B cells, and the local cytokine environment created by the activated TFH cells (2). The differentiation of TFH cells depends critically on the expression of the master transcriptional repressor Bcl-6 (3–5) and is characterized by the sustained upregulation of CXCR5, CXCR4, programmed death-1 (PD-1), and ICOS and the production of IL-21 and IL-4, which enable them to migrate to B cell follicles, engage with Ag-activated B cells, and support their proliferation and differentiation into GCs (2). Invariant NKT (iNKT) cells are a distinct subset of T lymphocytes that express the homolog invariant Vα14-Jα18 and Vα24-JαQ TCR chains in mice and humans, respectively, which pair with diverse TCRβ-chains that use Vβ8.2, Vβ7, and Vβ2 in mice and Vβ11 in men (6, 7). The semi-invariant TCR is restricted for CD1d, an MHC class I-like molecule expressed mainly on professional APCs. All iNKT cells recognize the CD1d-restricted strong agonist α-galactosylceramide (αGalCer) (8). Administration of αGalCer into mice rapidly activates iNKT cells to release copious Th1 and Th2 cytokines, including IL-4 and IL-21, and to upregulate CD40L (8, 9). As a result, activated iNKT cells license dendritic cells (DCs) via CD40 ligation, enhancing their capacity to induce concomitant Ag-specific CD4+ and CD8+ T cell responses (10). We have previously shown that activated human iNKT cells provide efficient CD1d-restricted cognate help for proliferation and Ab production by purified B cell in vitro (11). Furthermore, immunization of mice with protein Ags mixed with αGalCer (αGalCer+Ags) substantially enhanced protective serological immunity and B cell memory (12). In this immunization model, mouse iNKT cells helped B cells mainly indirectly via licensing of APC functions that resulted in an improved priming of Th cells and enhanced provision of MHC class II (MHC II)-restricted cognate help for B cells (13). However, immunization with Ags mixed with αGalCer, but not with other classic adjuvants, elicited detectable specific Ab titers also in mice lacking conventional CD4+ Th cells (MHC II−/−), suggesting that iNKT cells may directly help B cells in vivo (12). Given the relevant implications of these findings for the physiology of iNKT cells and their possible involvement in vaccine design, we have investigated the mechanisms by which these cells provide B cell help in MHC II−/− mice. CD1d−/− (B6.129-CD1tm1GruCD1d25), CD40−/− (B6.129-Tnfrsf5tm1Kik), B cell-deficient (μMT°; B6.129S2-Igh-6tm1Cgn), MHC II−/− (B6.129-H2Ab1tm1Doi/DoiOrl) (described in Ref. 13), C57BL6N (Charles River Italy), and μMT° × MHC II−/− mice (generated by in-house crossing) were maintained in specific pathogen-free conditions and used at 6–8 wk of age. All animal procedures were reviewed and approved by the Institutional Animal Care and Use Committee at San Raffaele Scientific Institute. Immunizations were performed s.c. at day 0 with Ag dissolved in PBS or mixed with 4 μg αGalCer (Alexis, Lausen, Switzerland). Tail vein blood was drawn at day 7 or 13 to determine primary specific Ab titers. Where indicated, mice were boosted on day 15 with the same Ag in PBS, and secondary Ig titers were determined at days 28, 84, and 133. Mice were immunized with either 4-hydroxy-3-nitrophenyl-chicken γ globulin (NP-CGG; Biosearch Technologies) at 50 μg/dose, human influenza virus A/Panama/2007/99-RESVIR17 hemoagglutinin/neuroaminidase subunits (H3N2; Novartis Vaccine) at 3 μg/dose, or a mixture containing 50 μg/dose NP-CGG and 3 μg/dose tetanus toxoid (Novartis Vaccine), BSA fraction V (Roche), influenza virus A/Panama/2007/99-RESVIR17 H3N2, and keyhole limpet hemocyanin (KLH; endotoxin-free; Calbiochem). NK cells or CD8+ T lymphocytes were depleted by injecting i.v. every 2 d anti-AsialoGM1 or anti-CD8α Abs, respectively, beginning at day −7 and continuing up to day 14 from the immunization. To block CD40–CD40L interactions in vivo, 400 μg MR1 anti-CD40L mAb (Taconic Europe, Ejby, Denmark) were given i.p. in 100 μl PBS at days 0, 2, and 4 from the immunization, a schedule optimized to inhibit GC induction (14). Individual sera were titrated in parallel at the same time for their Ag-specific Ab content by end-point ELISA as described (13). Ab titers are expressed as reciprocal dilutions giving an OD450 > mean blank OD450 + 3 SD. Blanks consistently displayed OD450 <0.1 and <10% variability. The following mAb conjugates were used to stain the cells: anti-CD1d–PE, anti-CD40–PE, anti-CD19–APC, anti–TCR-β–Pacific Blue, anti-CD4–allophycocyaninCy7, anti-PD-1–PECy7, anti-CD44–PerCPCy5.5 (BD Biosciences, San Jose, CA), anti-CXCR5–APC, anti-ICOS–FITC (BioLegend), and anti-Bcl-6–FITC (7D1; Santa Cruz Biotechnology). PBS57-loaded mouse CD1d-PE tetramers were obtained from the National Institutes of Health Tetramer Core Facility. Nonspecific binding was blocked with anti-CD16/CD32 24G2 mAb before staining. Stained cells were acquired on FACSCanto flow cytometers (BD Biosciences), excluding nonviable cells and aggregates. Data were analyzed using FlowJo software (Tree Star). Mixed bone marrow chimeras (BMCs) were generated as described (13). B cells were purified with anti-CD19 magnetic beads (Miltenyi Biotec) from spleens of wild-type (WT) or CD40−/− mice. Cell purity (>97%) was confirmed by flow cytometry analysis. A total of 107 B cells were injected in the tail vein. Mice were immunized 1 d after the transfer. Spleens were fixed with phosphate-buffered l-lysine with 1% paraformaldehyde/periodate overnight at 4°C and then cryoprotected by an ascending series of 10, 20, and 30% sucrose in PBS. Samples were snap-frozen in tissue-freezing liquid (Triangle Biomedical Sciences) and stored at −80°C. Sections 40-μm thick were mounted on Superfrost Plus slides (Fisherbrand) and stained with fluorescent Abs in a humidified chamber after Fc receptor blockade with 1 mg/ml Ab 2.4G2 (BD Pharmingen). Sections were stained with anti-IgD–FITC (eBioscience), anti-CD4–APC (BD Pharmingen), and Biotinylated-Peanut Agglutinin (Vector Laboratories, Burlingame, CA), followed by streptavidin-AlexaFluor568 (Invitrogen). Samples were mounted in FluorSave reagent solution (EMD-Calbiochem) and stored at 4°C until analysis. Images were collected with a Bio-Rad confocal microscopy system (Bio-Rad) using an Olympus BX50WI microscope (Olympus) and 10×/0.4 numerical aperture objective lenses and analyzed by Volocity software. Ab titers were log10-transformed and tested for normal distribution by using the Kolmogorov–Smirnov test for continuous variables. Geometric mean Ab titers (GMTs) and the 95% confidence intervals were derived from the anti-log10 of the mean, and of the mean ± SD, of the log10 titer transformations. Comparisons between two groups were done with the two-tailed Student t test for unpaired samples, applying correction for unequal variances when required. For all tests, a p value < 0.05 was considered significant. To determine the mechanisms by which iNKT cells enhance humoral responses elicited in MHC II−/− mice upon αGalCer+Ag immunization, we first assessed whether iNKT cells indirectly helped B cell activation by modulating the function of NK and CD8+ T cells, which are present in MHC II−/− mice and can modulate B cells response (15, 16). iNKT cells can activate both cell types via DCs licensing and IFN-γ production upon recognition of αGalCer–CD1d complexes presented by DCs (8, 10). NK or CD8+ T cells were hence depleted from MHC II−/− mice by injecting i.v. anti-AsialoGM1 or anti-CD8α Abs, respectively, before and after immunization. Flow cytometry analysis of the peripheral blood cells from all treated animals (Supplemental Fig. 1) and spleen cells from two additional mice sacrificed at the same day of immunization confirmed that the Ab treatment depleted >90% of NK or CD8+ T cells. Both Ab-treated and nontreated control mice were immunized with αGalCer+NP-CGG, and 2 wk later, their sera were collected to determine the NP-specific Ab titers. The Ab responses induced by αGalCer+NP-CGG immunization were comparable in both groups of mice (Fig. 1A), indicating that iNKT cells dispense help independently of NK or CD8+ T cells. These results also suggested that iNKT cells directly helped Ag-specific B cells by a mechanism entailing CD1d-restricted cognate interaction with B cell. To investigate this possibility, we generated mixed BMCs in which lethally irradiated recipient mice lacking both B and CD4+ T cells (μMT° × MHC II−/−) were reconstituted with transplanted bone marrow composed by 80% of cells from μMT° × MHC II−/− mice and by 20% of cells from either WT or CD1d−/− mice. The purpose of these chimeras was to generate mice in which: 1) iNKT cells were present; 2) CD4+ T cells were absent because of the lack of MHC II expression on thymic epithelium; 3) the majority of DCs expressed CD1d and presented αGalCer to iNKT cells; and 4) all B cells expressed or did not express CD1d (Fig. 1B). BMCs or MHC II−/− control mice were immunized s.c. with αGalCer+NP-CGG or with NP-CGG alone. After 14 d, sera were collected and their NP-specific IgG titers determined by ELISA. As shown in Fig. 1B, whereas the lack of CD1d expression by B cells completely abrogated the induction of specific IgG responses in BMCs, the expression of CD1d by B cells resulted in specific Ab titers that were comparable to those elicited in MHC II−/− control mice. The data thus indicate that iNKT cell help in absence of Th cells requires CD1d expression by B cells, arguing for a CD1d-restricted cognate iNKT–B cell interaction in vivo. The engagement of CD40 on B cells by CD40L on activated Th cells is a critical helper mechanism (1, 17). As iNKT cells upregulate efficiently CD40L upon αGalCer recognition in vivo (18), we assessed whether the expression of CD40 on B cells was required for the display of αGalCer-activated iNKT cell helper functions in MHC II−/− mice. B cells were purified from the spleen of WT or CD40−/− mice and adoptively transferred into μMT° × MHC II−/− recipient mice that lacked both B and Th cells. After 24 h, these mice were immunized with αGalCer+NP-CGG, and 14 d later, sera were collected and tested for NP-specific Ig titers. Note that we measured total Ig titers (rather than IgG), as CD40 engagement is critical to induce IgG class switch (19). As shown in Fig. 2A, immunization of mice bearing CD40-negative B cells completely failed to mount specific Ig titers, indicating that the expression of CD40 on B cells is critical for the iNKT-dependent induction of Ab responses. Next, we assessed the role of CD40L in our system. 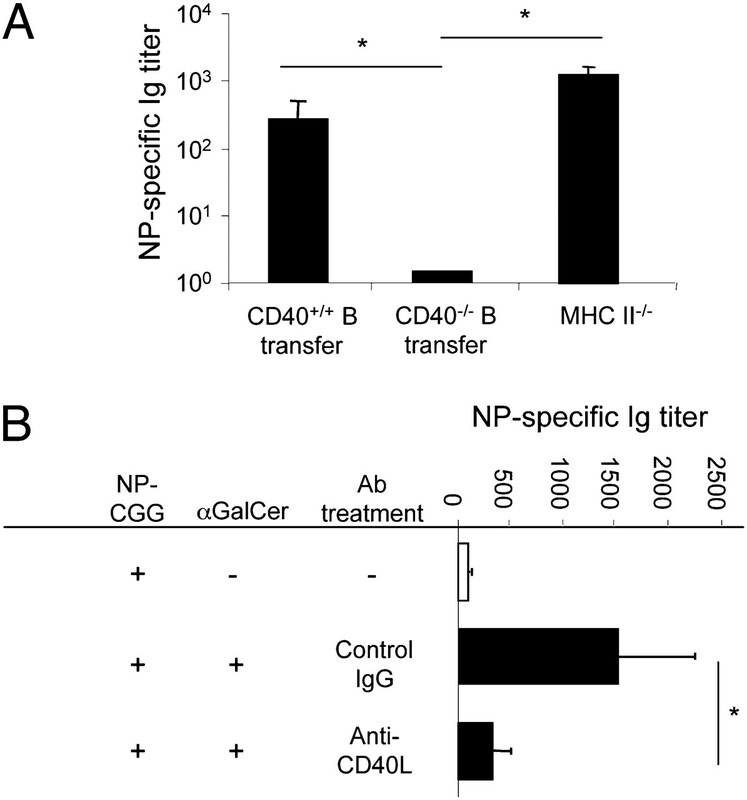 MHC II−/− mice received either anti-CD40L blocking mAb or control hamster IgG before and after immunization with αGalCer+NP-CGG and NP-specific total Ig titers were determined as above. Fig. 2B shows that blocking CD40L significantly impaired the Ig response, suggesting that CD40L is required to elicit B cell responses in the absence of Th cells. Collectively, these findings argued that CD40L, most likely expressed by activated iNKT cells, engages CD40 on B cells and promotes Ab responses independently of Th cells. Because iNKT cells can provide CD1d-restricted cognate help to B cells and elicit Ag-specific Ab titers in MHC II−/− mice, we sought to determine whether splenic iNKT cells acquire the typical CXCR5hiPD-1hiICOShiBcl-6hi TFH phenotype (2) and induce GC formation upon immunization with αGalCer+Ag. It is worth noting that both TFH and CD4+ T effector/memory cells upregulate these molecules early after Ag-specific activation. Only the former cells, however, sustain the expression of such phenotype for longer time, allowing them to be specifically identified up to 7–10 d post-Ag encounter (20). Separate groups of MHC II−/− mice and WT mice, the latter ones used to directly compare the status of TFH differentiation between iNKT cells and CD4+ T cells, were immunized with vehicle or with αGalCer mixed with 4 protein Ags (NP-CGG, BSA, KLH, and tetanus toxoid) and sacrificed 7 d later. As shown in Fig. 3A, the immunization of αGalCer+Ags increased the frequency of iNKT cells exhibiting a sustained upregulation of PD-1, CXCR5, ICOS, and Bcl-6 in the spleen of both group of mice, indicating that iNKT cells have the potential to acquire a TFH phenotype irrespective of the presence of CD4+ Th cells. The lack of CD4+ Th cells influenced, however, the relative rate by which iNKT cells differentiate into TFH cells, as indicated by the fact that we detected higher percentages of iNKTFH cells in MHC II−/− mice (albeit this occurred with greater inter individual variation) (Fig. 3A, 3B). By 7 d postimmunization, the total number of iNKT cells in the spleen had slightly contracted compared with control animals, whereas that of iNKT cells displaying the PD-1hiCXCR5hi follicular helper phenotype had increased, suggesting a possible selective survival and/or retention of iNKTFH cells in secondary lymphoid organs following Ag-induced differentiation. Notably, the absolute number of iNKTFH cells in both MHC II−/− and WT mice was ∼10 times lower than that of CD4+ TFH cells detected in WT animals (Fig. 3B). Assuming that all latter cells are Ag specific, these results imply that iNKT cells have a reduced helper potential when compared with CD4+ TFH cells. On average, 80% of splenic iNKT cells that acquired a PD-1hiCXCR5hi TFH phenotype displayed the CD4+ phenotype (data not shown), consistent with the published finding that IL-21, the cytokine critical to sustain the follicular help and GC formation, is produced mainly by splenic CD4+NK1.1− iNKT (9). In line with the acquisition of a TFH phenotype by iNKT cells, we detected the presence of GCs in the spleen of MHC II−/− mice 7 d after immunization with αGalCer+Ags (Fig. 4A). This finding is remarkable, because MHC II−/− mice are unable to generate either GCs or Ag-specific IgG responses when immunized with Ag admixed with aluminum hydroxide adjuvant (12, 21). Together, these results suggested that iNKT cells can acquire a typical TFH cell phenotype and induce GC formation in the absence of CD4+ TFH cells. Given the induction of GC reactions in the spleen of MHC II−/− mice immunized with αGalCer+Ag, next, we investigated the dynamics by which Ab responses are induced in these mice. MHC II−/− mice and WT controls were primed with the clinically relevant subunit vaccine influenza H3N2, given alone or with αGalCer, boosted 2 wk later with Ag alone, and assessed for their serum Ag-specific IgG titers at various intervals for >4 mo. MHC II−/− mice immunized with H3N2 plus αGalCer mounted detectable H3N2-specific IgG Abs (Fig. 4B), consistent with the CD40 engagement on B cells required for Ig class switch (19). When compared with Ab responses detected in WT controls, however, Ab responses in MHC II−/− mice were lower, more transient, and also unresponsive to boosting (Fig. 4B). This suggests that iNKTFH cells are specialized in initiating the primary B cell response but, in the absence of CD4+ TFH, they cannot sustain the establishment of long-lasting Ab titers. Previous studies have shown that immunization of WT animals with NP-KLH simply mixed with αGalCer elicits Ab responses that require both the expression of CD1d by B cells and the concomitant presence of CD4+ Th cells (22, 23). Furthermore, immunization of WT animals with B cell Ags chemically conjugated with αGalCer stimulated the delivery of CD1d-restricted cognate help by iNKT cells, which resulted either in marginal zone B cell activation (24) or Ag-specific extrafollicular plasma cell responses (25). Very recently, a study has been published describing the induction of iNKTFH cells upon immunization of C57BL6 mice with antigenic complexes (the protein hen egg lysozyme directly complexed with αGalCer or the haptenated lipid NP-αGalCer) that do not activate CD4+ TFH cells (26). Furthermore, a second study has shown that the cognate help delivered by iNKT cells to B cells upon immunization of mice also with NP-αGalCer critically depended on IL-21 produced by iNKT cells, suggesting that iNKT cells display follicular helper cell functions (27). Our present results not only confirm the direct helper functions of iNKT cells but also extend our understanding of the mechanistics of this phenomenon. We show indeed that iNKT cells can differentiate into specialized TFH effectors upon immunization with protein Ags simply mixed with αGalCer and induce GC formation in the complete absence of CD4+ TFH cells. Consistent with the acquisition of follicular helper functions by iNKT cells, our mixed radiation chimeras and B cell transfer experiments provide direct evidence that iNKT cells deliver CD1d-restricted and CD40-dependent cognate help to B cells. We previously showed that iNKT cells display their adjuvant effect for Ab production in WT mice in a noncognate manner by facilitating DC priming of CD4+ Th cells, leading in turn to the enhanced delivery of classic help to specific B cells (13). We show in this study that, in mice lacking CD4+ Th cells, iNKTFH cells directly help B cells in a CD1d-restricted and CD40-dependent fashion. Together, these different sets of results imply that both cognate and noncognate help by iNKT cells can coexist and are differentially delivered, depending on the level of involvement of conventional TFH cells. When both conventional TFH and iNKT cells are present and encounter both lipids and protein Ags, the number and function of conventional TFH overwhelms those of iNKTFH cells, making their CD1d-restricted cognate help to B cells irrelevant to elicit a humoral response (13). Instead, when there is little or no function of conventional TFH, such as in vitro with purified iNKT and B cell cocultures (11), in vivo in mice lacking CD4+ T cells, or in natural immune responses against helpless Ags that do not carry MHC II-restricted epitopes (24–27), the cognate help by iNKTFH cells to B lymphocytes becomes necessary to activate Ab production. The iNKTFH cells stem from peripheral mature precursors in the secondary lymphoid organs, suggesting that these cells maintain a remarkable degree of functional plasticity. This allows iNKT cells to adopt some features of adaptive effector T cells, such as the ability to help B cell responses. Interestingly, we find that the CD1d-restricted cognate help delivered by iNKTFH cells to B cells results in Ab responses of shorter duration compared with those elicited by classic CD4+ T cell help, in line with the recently published data obtained with different experimental models (26, 27). This would be consistent with the putative role of iNKT cells as innate sentinels that rapidly alert both innate and adaptive immune responses upon tissue infection and damage, eliciting short-lasting Ab responses but being unable to support long-lived responses. To this regard, only the noncognate iNKT cell help, recruited upon immunization of CD4+ Th cell-competent mice with protein Ag mixed with αGalCer, can induce robust humoral memory response, comparable to those elicited upon immunization with the same protein Ags mixed with the classic adjuvant aluminum hydroxide (12, 13, 27), owed to the concomitant activation of the more potent TFH cells. Why iNKTFH cells are not as efficient as TFH cells is not clear: quantitative and/or as yet unknown molecular differences between the two subsets might account for their distinct ability to help B cell responses. Future studies are needed to address this crucial difference. TFH cell differentiation requires sustained Ag stimulations delivered initially by DCs within the T cell zone, followed by Ag-activated B cells first at the T-zone/follicle border and then in the GCs (28). The anatomical location of iNKT cells in the periarteriolar sheath of the mouse spleen, among conventional T cells and DCs (29), would favor this complex set of interactions. It is conceivable that iNKT cells receive a strong activation signal delivered by DCs presenting αGalCer bound to CD1d, resulting in the upregulation of CXCR5 and the other follicular helper molecules necessary to reach the follicle and contact the Ag-activated B cells that have also internalized αGalCer and present it on CD1d. This view finds support in the data recently published by Chang et al. (26), showing the requirement for both the presence of B cells and for CD1d-expressing myelomonocytic APCs to induce and maintain iNKTFH cells. Only TFH cells expressing the highest amount of CXCR5 and Bcl-6 can further reach the GCs (2). We find comparable levels of upregulation of CXCR5 and Bcl-6 by splenic CD4+ TFH and iNKTFH cells in immunized mice, suggesting that both subsets are endowed with a migration potential to follicles and GCs, as shown by Chang et al. (26). The recent description of CD4+CD25+Foxp3+ regulatory T cells that acquire a CXCR5hiPD-1hi TFH phenotype and migrate into GCs, where they maintain self-tolerance and limit the outgrowth of non–Ag-specific B cells rather than activating responses (30, 31), suggests that different T cell subsets can be co-opted in the TFH differentiation pathway to perform distinct functions in the B cell response. In line with the concept of distinct follicular helper functions, both the recently published data (26, 27) and our present study show that iNKTFH cells induce, although they do not sustain, specific Ab responses. In conclusion, the cognate or noncognate mechanisms by which iNKT cells can deliver help for B cell responses suggest that the helper ability of iNKT cells is context dependent. From a translational point of view, our findings may have potential implications both for the implementation of vaccine design and our understanding of the natural role for iNKTFH cells in the pathophysiology of protective or autoreactive B cell responses. We thank Dr. Grazia Galli (Novartis Vaccine, Siena, Italy) for helpful discussion. This work was supported by grants from the Cariplo Foundation (Vaccine Program) (to S.A. and P.D. ), Regione Lombardia (International Cooperation Project) (to L.G.G., G.C., and P.D. ), and Associazione Italiana per la Ricerca sul Cancro (IG5804 to G.C.).
. 1994. An invariant T cell receptor alpha chain is used by a unique subset of major histocompatibility complex class I-specific CD4+ and CD4-8- T cells in mice and humans. J. Exp. Med. 180: 1097–1106.
. 1994. An invariant V alpha 24-J alpha Q/V beta 11 T cell receptor is expressed in all individuals by clonally expanded CD4-8- T cells. J. Exp. Med. 180: 1171–1176.
. 2007. The biology of NKT cells. Annu. Rev. Immunol. 25: 297–336.
. 2008. Diverse cytokine production by NKT cell subsets and identification of an IL-17-producing CD4-NK1.1- NKT cell population. Proc. Natl. Acad. Sci. USA 105: 11287–11292.
. 2003. NKT cells enhance CD4+ and CD8+ T cell responses to soluble antigen in vivo through direct interaction with dendritic cells. J. Immunol. 171: 5140–5147.
. 2003. CD1d-restricted help to B cells by human invariant natural killer T lymphocytes. J. Exp. Med. 197: 1051–1057.
. 2009. NKT-cell help to B lymphocytes can occur independently of cognate interaction. Blood 113: 370–376.
. 1994. gp39-CD40 interactions are essential for germinal center formation and the development of B cell memory. J. Exp. Med. 180: 157–163. 2004. Interactions between NK cells and B lymphocytes. Adv. Immunol. 84: 1–42.
. 2005. Cutting edge: antibody production to pneumococcal polysaccharides requires CD1 molecules and CD8+ T cells. J. Immunol. 174: 1787–1790. 1993. T cell-dependent B cell activation. Annu. Rev. Immunol. 11: 331–360.
. 2006. Glycolipid alpha-C-galactosylceramide is a distinct inducer of dendritic cell function during innate and adaptive immune responses of mice. Proc. Natl. Acad. Sci. USA 103: 11252–11257.
. 1994. The CD40 antigen and its ligand. Annu. Rev. Immunol. 12: 881–922.
. 2011. Germinal center B cell and T follicular helper cell development initiates in the interfollicular zone. Immunity 34: 947–960.
. 1991. Mice lacking MHC class II molecules. Cell 66: 1051–1066.
. 2008. Requirement for CD1d expression by B cells to stimulate NKT cell-enhanced antibody production. Blood 111: 2158–2162.
. 2008. B cell receptor-mediated uptake of CD1d-restricted antigen augments antibody responses by recruiting invariant NKT cell help in vivo. Proc. Natl. Acad. Sci. USA 105: 8345–8350.
. 2012. Identification of Bcl-6-dependent follicular helper NKT cells that provide cognate help for B cell responses. Nat. Immunol. 13: 35–43.
. 2012. Invariant natural killer T cells direct B cell responses to cognate lipid antigen in an IL-21-dependent manner. Nat. Immunol. 13: 44–50.
. 2011. Regulation of T follicular helper cell formation and function by antigen presenting cells. Curr. Opin. Immunol. 23: 111–118.
. 2011. PLZF induces an intravascular surveillance program mediated by long-lived LFA-1-ICAM-1 interactions. J. Exp. Med. 208: 1179–1188.